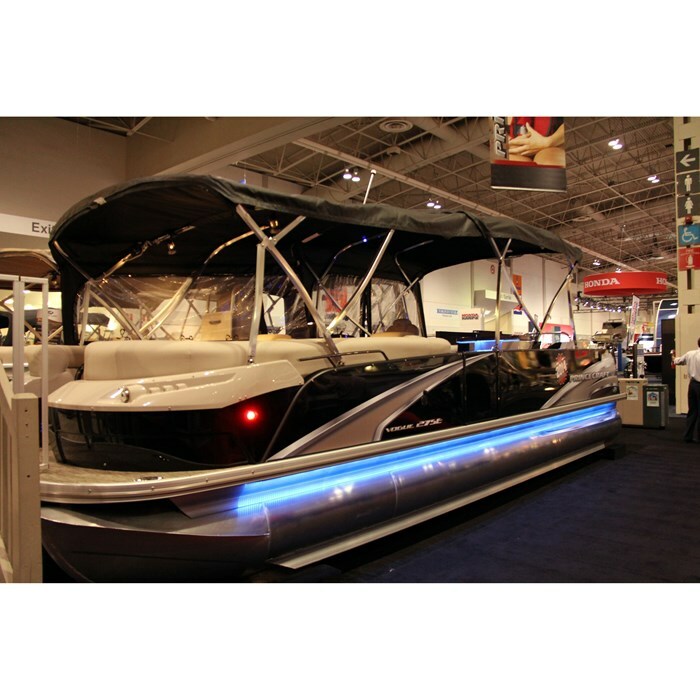 For 2013, Princecraft Boats of Princeville, Quebec, a Brunswick Company, introduced the upscale Vogue series of pontoon boats consisting of five models from twenty-one to twenty-five feet. The year 2014 marks the sixtieth anniversary of this legendary Canadian aluminum boat builder with the expansion of this successful Vogue series to eight models including two twenty-seven footers. The Vogue 27 SE subject of this review is the largest and most prestigious of all Vogue models. The eight model Vogue series is one of eight series of pontoon boats, including the new six-model Quorum series, offered by Princecraft this year consisting of a total of thirty-one models from fifteen to twenty-nine feet – mostly gasoline outboard powered but including two SVX sterndrive models and two electric outboard powered Brio models. In addition, Princecraft offers six models of aluminum deck boats from nineteen to twenty-two feet plus a huge selection of forty-four models of fishing, utility, and Jon boats in nine series from ten to twenty feet. The Vogue 27 SE is so new that it didn’t even make it into Princecraft’s 2014 printed catalogue, however it is fully presented on Princecraft’s website. The 27 SE differs from the standard Vogue 27 simply by the substitution of the rear portside lounge on the 27 with an innovative and impressive molded aft bar section on the SE consisting of three major components: a rear corner module with integrated cooler, a centre “bar” unit, and four adjustable bar stools. This unit adds flexibility in meal preparation and presentation, sit down or stand-up eating, plus entertaining and relaxation. 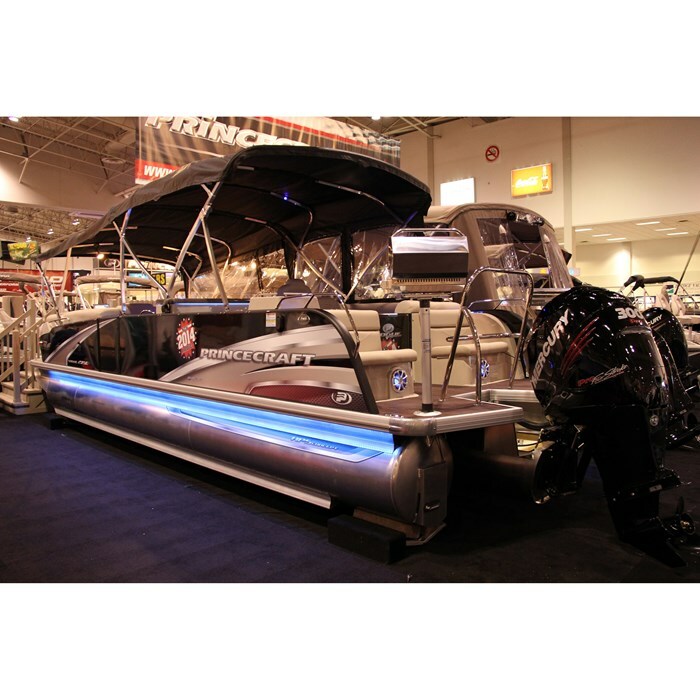 One other major feature that distinguishes all Vogue models is the fibreglass molded, rounded, and contoured bow section with integrated LED lighting and halogen docking lights which replaces the normal aluminum fencing found on most pontoon boats. Another standout feature of all Vogue models is the very large woodgrain style, vinyl covered rear swim deck which on the 27 SE includes two rear-facing upholstered corner seats with built-in drinkholders and storage within. Interior seating accommodation rated for a maximum thirteen persons on the 27SE consists of three chaise lounges: two in the bow section facing each other, plus one facing the bar unit on the starboard stern side behind the driver’s adjustable and swivelling reclining Captain’s chair. All lounges have composite Roto Cast bases and backs with storage throughout. A removable bow gate seat, when in place, converts the bow section to one huge U-shaped lounge. A standard portside pop-up privacy enclosure can be fitted with an optional slide-out chemical toilet. A pedestal bow table between the two lounges is standard. The molded helm of the Vogue 27 SE includes a sink with faucet, electric pump, and portable water tank along with built-in storage on the front side of this console. On the driver’s side, the sport tilt steering wheel faces woodgrain panel inserts housing standard outboard instrumentation including tachometer, speedometer, voltmeter, trim, and fuel gauges. 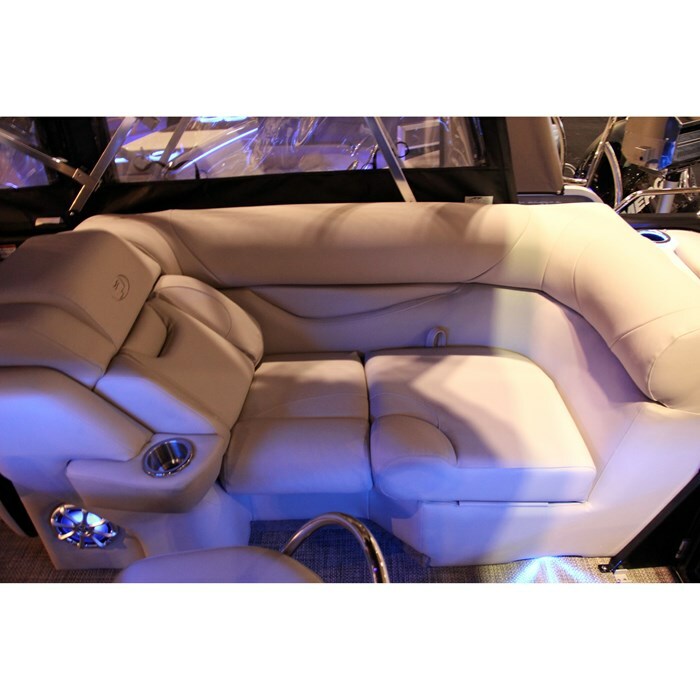 These can be upgraded with Mercury SmartCraft gauges. An in-dash Lowrance depth sounder with water temperature gauge is standard. To the right is the console-mounted Clarion 200-watt AM/FM/Bluetooth POLK Stereo compatible SAT with USB plug and auxiliary input. A remote control for this unit is standard. 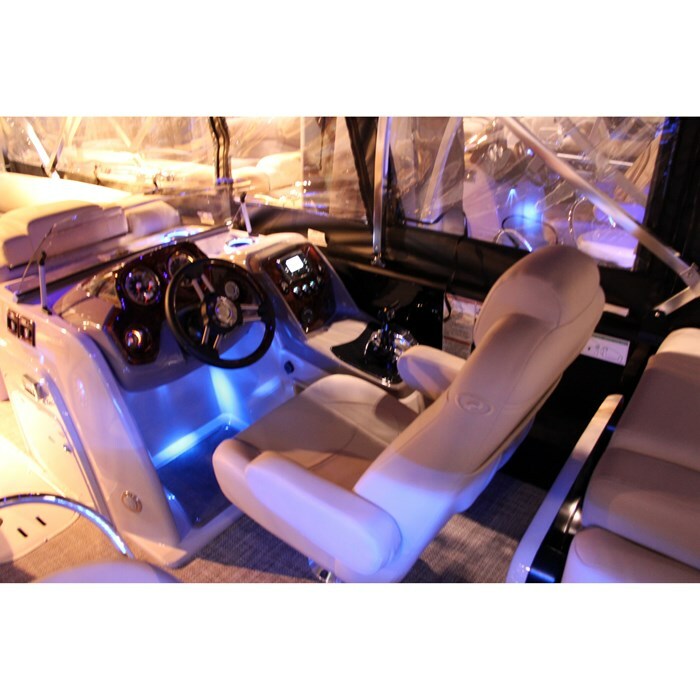 Other standard equipment includes a bimini top, stern boarding ladder, and floor mood lighting. 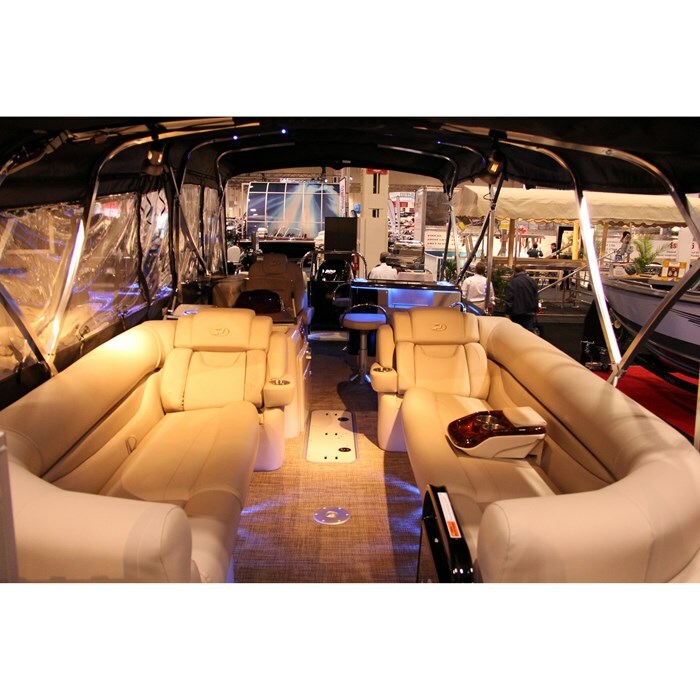 Notable optional equipment includes upholstery and flooring upgrades, in-floor anchor and/or waterski storage compartments, stainless steel waterski tow bar, gas barbeque, underwater lighting, full camper enclosure and a trailer. 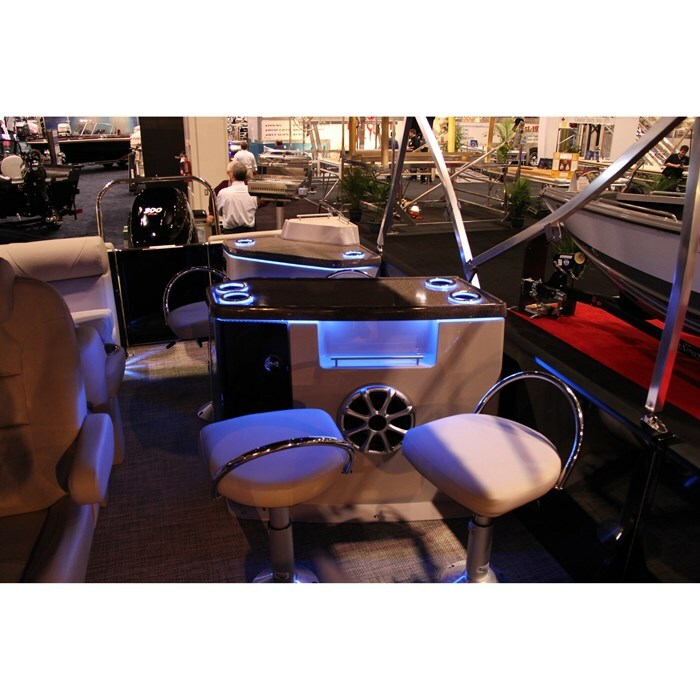 Choose the Prestige Edition option and receive a Prestige Edition logo on both sides, monochrome upholstery with "Reflection" vinyl, DEL lighting on floor, bimini top, pontoon logs, speakers and fixed cup holders, an upgraded stainless steel ladder, a 2-tone snack table plus LED lighting under the counters with simili granit tops. One of the neatest options worth considering, as long as you stick with the standard 2-log configuration, is the BeechLander electric ramp, a non-slip, water-resistant carpet covered aluminum ramp which extends (and retracts) electrically from underneath the bow of the Vogue 27 SE allowing for much easier boarding from a beach for children, pets, or anyone with reduced mobility. The standard two-log configuration of the Vogue 27 SE can be powered with Mercury 40 through 150 horsepower 4-strokes or the 150, 175, or 200 Mercury Verado 2-strokes. The optional 2-log Speed package adds lifting strakes and an under-deck spray shield allowing more performance from the 90 through 200 horsepower engine choices above. An optional Performance Package adds a 3rd log, under-deck spray shield, SeaStar hydraulic steering system, lifting strakes, bigger fuel tank, and one in-floor storage compartment. This package allows a power increase up to the Mercury 300 horsepower Verado. Princecraft – still going strong after sixty years.